The Ukrainian Air Assault Forces, abbreviated DShV (from "Desantno-shturmovi viyska Ukrayiny", Ukrainian: Десантно-штурмові війська України, ДШВ; Air-Assault Forces of Ukraine), are a branch of the Armed Forces of Ukraine. The air assault forces field high-readiness ground units without air-assets. The air assault forces are in constant combat readiness and are the high mobility branch of forces. They are considered the elite of Ukraine's armed forces. The Ukrainian Air Assault Forces were created in 1992 from units of the Soviet Airborne Troops stationed on Ukrainian territory after the Dissolution of the Soviet Union on 25 December 1991. In the 15 years after their creation Ukrainian paratroopers have served in peacekeeping missions to the Balkans, in Iraq, Kuwait, Lebanon, Sierra Leone, Liberia, Ethiopia, Georgia and DR Congo. In 2007, the 13th Separate Airmobile Battalion served as part of Polish–Ukrainian Peace Force Battalion, a peacekeeping unit with Kosovo Force. In August 2014 the 95th Air Assault Brigade conducted a raid behind the separatist lines. 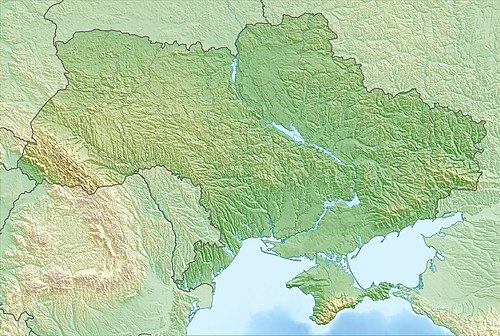 The 95th Brigade, which had been reinforced with armor assets and attachments, launched a surprise attack on separatist lines, broke through into their rear areas, fought for 470 kilometers, and destroyed or captured numerous Russian tanks and artillery pieces before returning to Ukrainian lines and established a corridor in which the Ukrainian army units and civilians trapped at the border could retreat. It was one of the longest raids in the military history. In 2016, Ukrainian Airmobile Forces where formed in independent branch of the Armed Forces. Previously, they were part of Ground Forces. On 21 November 2017 (Ukraine's Paratroopers' Day) President Petro Poroshenko stated that 469 Ukrainian paratroopers had been killed in the (ongoing) War in Donbass. On 21 November 2018 he adjusted this to 487 killed. On 21 November 2017 the Air Assault Forces also received its new insignia (the dome of a parachute "as a symbol of airborne units around the world" and the wings of Archangel Michael and "the flaming sword with which he hits the enemies"). The color of the Ukrainian paratroopers was also changed to maroon. 21 November 2017 was the first time Air Assault Forces Day in Ukraine was celebrated on 21 November. Up to 2017 this day was celebrated on 2 August, as it was in the Soviet Union. According to President Poroshenko “It is logical to celebrate your professional holiday on November 21. The usual August 2 is the date of the first jump of paratroopers in the Moscow Military District. How is it about us? Moscow is not Kyiv. As well as "Ukraine is not Russia." He added that "The start of the new Paratroop Day is part of the Ukrainianization of the historical and political calendar - the replacement of the Soviet-Russian imposed upon us." From 2017 onward, the UkrAAF wear the maroon berets common among many Western airborne units. Structure of the Ukrainian Air Assault Forces in 2017 as per the best available Ukrainian language sources. In 2014, the staffing of an airmobile brigade was brought to 1,200 personnel. In addition, each brigade was given at least one artillery battalion from the 25th and 55th artillery brigades and a tank battalion. Currently, the total staffing of the brigades range from 1,000 to 2,200 personnel, depending on deployment. Most of the brigades operate in 1-2 battalion tactical groups, in each of which, in addition to infantry battalions, there are up to two artillery battalions and at least one tank company equipped with BTRs and BMPs. The commander of the Air Assault Forces since 2 August 2015 is Lieutenant-general Mykhailo Zabrodskyi. A Ukrainian soldier prepares to engage the opposition forces during an air assault at Exercise Rapid Trident 16 July 3, 2016. AGS-17 "Plamya" (Flame), the automatic grenade launcher – may being replaced by a much lighter UAG-40. ZU-23-2, an aged but effective and powerful design of a double barrel 23mm anti-aircraft gun, commonly used against infantry and even APCs and IFVs, it is either mounted on any amphibious hulls, usually based on PT-76 light tank, or can be towed by jeep or truck as it has wheels. ^ "Ukrainian paratroopers celebrate 15th anniversary" (PDF). KFOR Chronicle. 31 August 2007. p. 23. Archived (PDF) from the original on 25 September 2012. Retrieved 6 June 2016. ^ "21st Century Maneuver | Marine Corps Association". www.mca-marines.org. Archived from the original on 2017-08-25. Retrieved 2017-08-24. ^ "Основні показники реформування Міністерства оборони та Збройних Сил у 2016 році". www.ukrmilitary.com. Archived from the original on 2017-09-07. Retrieved 2017-11-27. ^ "New Airborne Brigade created in Ukrainian Army". UNIAN. 19 October 2016. Archived from the original on 20 October 2016. Retrieved 20 October 2016. ^ "Захисти своїх". Archived from the original on 2017-02-02. Retrieved 2017-01-19. ^ "46 окрема десантно-штурмова бригада ВДВ ЗС України запрошує на службу! Захисти своїх!". Archived from the original on 2017-02-14. Retrieved 2017-01-19. ^ a b "Ukrainian Military Pages: Високомобільні десантні війська" [Airmobile Forces Structure]. www.ukrmilitary.com (in Ukrainian). Archived from the original on 2016-09-02. Retrieved 2016-07-04. ^ "Сергій Машковський привітав військовослужбовців 199 навчального центру ВДВ ЗСУ" [199th Training Center Airmobile Forces welcomed by Sergey Mashkovsky]. oda.zt.gov.ua (in Ukrainian). Archived from the original on 2016-04-13. Retrieved 2016-03-25. ^ "President conferred the rank of Brigadier General to commander of the Airborne Forces Mykhailo Zabrodskyi". Ministry of Defence of Ukraine. 2 August 2015. Archived from the original on 3 August 2016. Retrieved 6 June 2016. ^ "Automatic grenade launcher UAG-40". www.lk.com.ua. Public Company Leninska Kuznya Plant. Archived from the original on 2016-06-02. Retrieved 2016-06-06. This page was last edited on 14 April 2019, at 09:30 (UTC).